Now I’ve been living in Ireland for the past 8 months and am about to experience my first truly Irish St Patrick’s Day, but it won’t be my first ever. Whilst away travelling I had a lot of Irish friends, as well as an Irish girlfriend and being someone who has worked in bars for most of my adult life I noticed a few things about a day that revolves around drinking. Yes, on this day and this day only it is socially acceptable to act in the same way as the bums, alcoholics and wasters. Those that would normally be the first customers in the pub each day with their dole or pension money at the ready are joined by the rest of the Irish population waiting to get absolutely wasted. Big tall hats with the Guinness logo on and ginger beards attached and big badges with slogans such as ‘kiss my clover’ will be going around. Most people will be wearing these for a bit of fun, but there will be a few who think they actually look good. Keep away from these people. Even though the guy standing next to you in the bar is from Thailand and has never left his country before now- even he, somehow, has Irish roots. This is what everyone fools themselves in to thinking on Paddy’s Day and will proudly proclaim to anyone willing to listen. Is it the fact that they're jealous of the way the Irish proudly embrace their patron saint’s day and make use of it? Probably, but they’ll never admit it. Got Jameson’s behind the bar? Serve Guinness on tap? If your bar is serving Irish imported booze then it’s going to be hit hard. Going back to point 3, part of everybody needing to feel like their Irish means sticking to the Irish liquor and with so many people out using the day as a hall pass for intoxication you’ll need plenty of reserve stock! Although this is an obvious one I feel it needs mentioning. 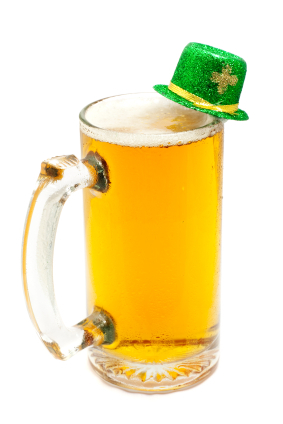 In my experience St Patrick’s Day isn’t just a day of drinking; it’s a day when people get so drunk they are being carried home at 2pm in the afternoon. Last year my girlfriend couldn’t even stand up straight at 5pm and we hadn’t even left the house at that point. The fact that the next day is still a work day won’t matter to the masses; they will be out in force acting as though this is the one day of the year that booze will be available. So, you’ve been warned! Although most people reading this will actually be part of the crowd committing at least a couple of the points above. Still, spare a moment's thought for those of us working on this day and dealing with the aftermath, although I don’t think even St Patrick himself will be able to help us.